about one year in each of two churches. Click image or text for YouTube video. The following audio tracks are from audio tapes of the original Between Time program, video-taped each Sunday and aired each Monday evening on WCPO-TV... for 13-weeks (no more, no less), during the first half of 1965. The reel-to-reel audio tapes (video not available) have been in a carton traveling several thousand miles over the past 51 years before they saw the light, again. Final post-production of these audio files from .wav to .mp3 format is by Stan Hertzman. Paul Simons and George Makrauer contributed to this effort, which was accomplished cooperatively, because none of the three made of us any smart-alec political cracks or ad hominem remarks about each other or political candidates. For our Between Time performances, Hertz carried rhythm guitar, Euge a busy driving bass line, Si delivered spectacular lead guitar solos, and George just pounded away. The program producer's audio objective was to meld the band's performance with the audience and dancers' reaction and participation, such as hand-clapping. Open studio mics over the audience captured their "contributions." The result is a fairly "echoey" overall ambiance, not merely adding, for example, reverb effects to the vocals and/or instruments..
"Good Good Loving" writing credits as "Shubert-Brown." Albert Shubert and James Brown. Released by Chubby Checker in 1961. Written by Chuck Berry. First Played in Concert	January 16, 1963 by Cliff Richard & The Shadows at St. Georges Cricket Ground, Port Elizabeth, South Africa. Most Recently Played	August 19, 2015 by Tom Jones at Bratislava Castle, Bratislava, Slovakia. "Rock and Roll Music" is a 1957 hit single written and recorded by rock and roll icon Chuck Berry. The song has been widely covered, and is recognized as one of Berry's most popular and enduring compositions. In the fall of 1957, the song reached #6 on Billboard magazine's R&B Singles chart and #8 on the Hot 100 chart. "Shake a Tail Feather" (Otha Hayes, Verlie Rice, and Andre Williams) is a song originally recorded in 1963 by the Chicago-based group The Five Du-Tones. "Slow Down" is a 24-bar blues written and performed by Larry Williams. Released as a single in 1958, it was a rhythm and blues hit that influenced the growing Rock & Roll movement of the time. It was released as a 7" single (45RPM). The A-Side was "Dizzy Miss Lizzy" and the B-Side was "Slow Down", which were both covered by The Beatles in 1964 and 1965, respectively. "Tell Her No" is a hit single by British rock band The Zombies in 1965, featured on their debut album The Zombies. It peaked at No. 6 on the Billboard Hot 100 chart in the United States in March 1965 and was one of three big American hits by The Zombies (the others being "She's Not There", in 1964, and "Time of the Season", in 1969). "Watermelon Man" is a jazz standard written by Herbie Hancock, first released on his debut album, Takin' Off (1962). First version was released as a grooving hard bop and featured improvisations by Freddie Hubbard and Dexter Gordon] A single of the tune reached the Top 100 of the pop charts. Cuban percussionist Mongo Santamaría released the tune as a Latin pop single the next year on Battle Records, where it became a surprise hit, reaching #10 on the pop charts. Santamaría's recording was inducted into the Grammy Hall of Fame in 1998. For The Teardrops guest performance of their top hit, THEM provided back-up instrumental for this live-on-tape appearance. That was much to the disappointment and irritation of their band, which showed up at the studio with the singers. But, since possession is nine-tenths of the law -- especially when what's possessed is a small stage from which THEM's members were not of a mind to de-possess THEMselves -- and THEM had practiced to play the Teardrops' hit, we sat still and asked the singers if they wanted to do a run-through. We did one run-through with the singers; no changes requested. When that show's taping was over and the girls were leaving, THEM's drummer said to one of the girls, "You sounded great, and we really enjoyed backing you up... hope you liked it." She replied -- reading their band's displeasure in not playing -- "You guys did a great job," and she gave a wink for the four of us, which was the real compliment, not wanting to say more that her band could have heard. The Teardrops were an American girl group popular during the 1960s. 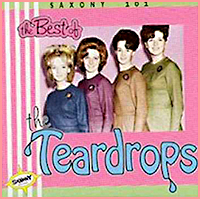 The Teardrops were formed around 1961 by two friends, Dorothy Dyer and Linda Schroeder, (both girls were 14 years of age at the time) in Cincinnati, Ohio. They later recruited ... friend Pat Strunk as the third voice. During 1962-63 the trio (was) performing at local teen venues in Cincinnati until ... spotted by musician/arranger George Bud Reneau (and) his partner, songwriter, Paul Trefzger. The trio signed with Bud and Paul's Saxony Records in 1964; along with the deal came fourth member, Wanda Sheriff. The now quartet recorded "Tonight I'm Gonna Fall In Love" / "That's Why I'll Get By" in the fall of 1964. It received local airplay in Cincinnati and other cities across the US. The Teardrop's local success had them opening for The Beach Boys and Sonny and Cher.